Whether your site is brand new or it’s been around for a while, you’ve probably felt the need to tidy the content up a bit. Maybe some pages still have placeholder text, or some are outdated, or some… well, they’re just not up to your current standards. Going through your website and doing a content audit can be a big job, but there’s a plugin to make it much easier. The Content Audit plugin can help you get a handle on the work that needs to be done on your website. 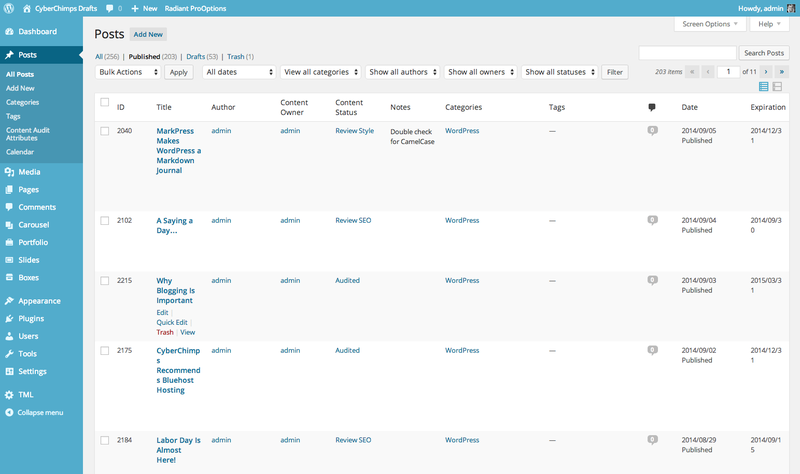 There are so many useful features that Content Audit brings to your WordPress site. For starters, it adds an “Outdated Content” meta box on the main Dashboard that lists all the work that you’ve tagged on the site as needing to be done. Or if you click on the menu item under Dashboard, you’ll see a more comprehensive status board of where you are in the audit process. It also adds a “Content Audit Attributes” item to the Posts and Pages menus which lets you add what amounts to categories of the types/status of work to be done. The defaults include “Audited,” “Outdated,” “Redundant,” Review SEO,” “Review Style,” and “Trivial,” but you can change these or add your own attributes. The plugin does its real work on the Post and Page editing screens where it adds a few extra fields to help you manage the auditing task. One is the ability to check which of those previously mentioned attributes apply to that post/page. There’s also a box to add “Content Audit Notes” so you can remember what exactly needs to be done to bring it up to standards. You also have the ability to assign the page to a “Content Owner” who can be different than the author. That can be really helpful if the “webmaster” spun up all the pages initially, if there’s turnover or changes in duties, or if you need a department head to be responsible for content. One other feature the plugin adds is the ability to add an Expiration Date if the information is perishable or needs changing at a particular time. Killer feature if you have pages with content such as annual policies, quarterly numbers, or school year info. The plugin really makes it’s presence known on the Posts and Pages screens. 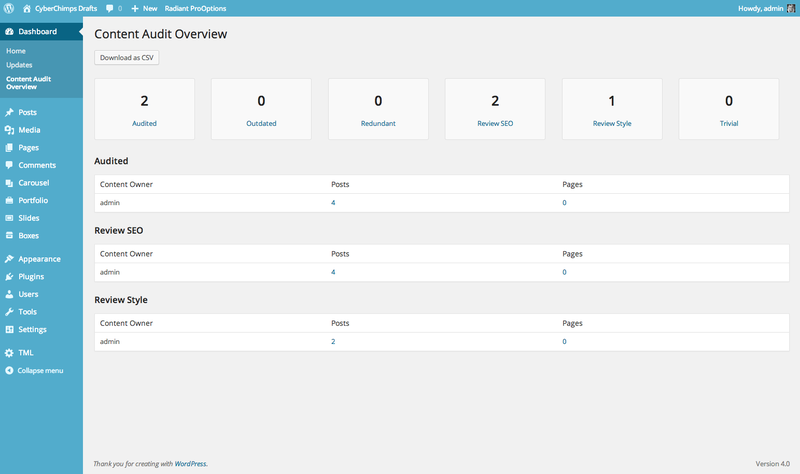 Columns are added to the listing to identify the Content Owner, Content Status, and the Content Audit Notes that were added. This makes it easy to not only see what needs working on, but to pick and choose which content you can tackle if you’ve only got a few minutes at your disposal. You can also sort by Expiration Date to find those items that might need urgent attention. 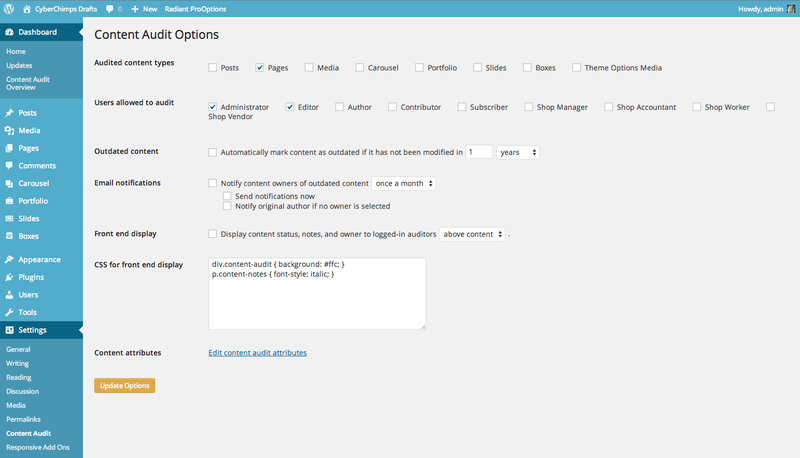 Content Audit allows you to decide what should and shouldn’t be included through its Settings area. You can choose to include Posts, Pages, Media, and any other content types that might be on your site. 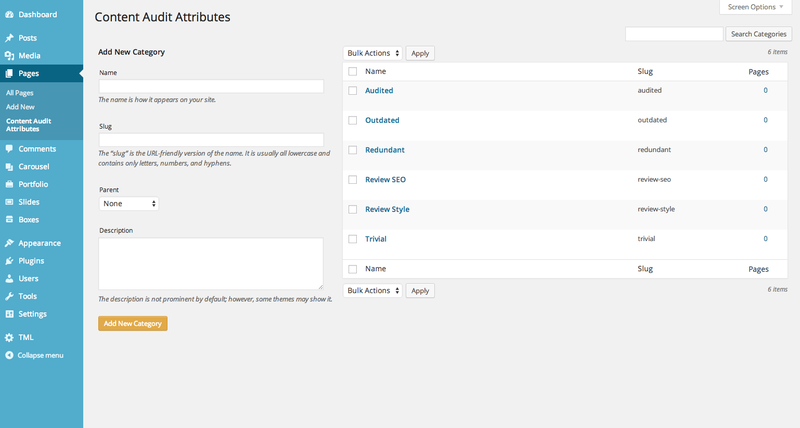 If you only want certain categories of users to see the Content Audit information, you can limit it by user roles. It also allows you to automatically mark all items as expired if you want to set a policy of revisiting content regularly, say every year. And if an item becomes expired, an email can be sent to the content owner as a reminder. (Not sure how it handles emailing mass notifications, if for instance you have 100 pages expiring on the same date.) Plus, you can have it display a reminder on the front-end – including Preview pages – to make it quite obvious to authorized users that there’s work to be done. The Content Audit plugin helps you manage the sometimes overwhelming task of reviewing and updating your site in an efficient, pleasant way. It makes the job easy to do in small bites, but it’s persistent enough to not let you forget to get the job done. Easily one of my favorite plugins for managing content. Can even be helpful if you are working with clients to get a site ready for release. Now, go forth and get it done! Nice to hear from you. This plugin is sweet. And just in time. We really need to overhaul our site. Hope you are well! Thanks Jason. I remember when I first discovered this plugin. It was like they read my mind. Really solves a problem! Good luck with your overhaul!